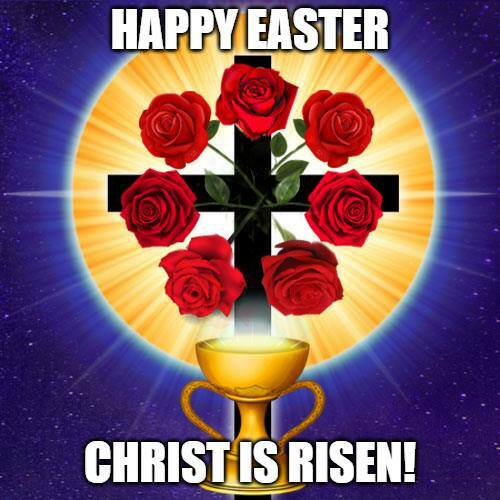 I hope everyone has a blessed and happy Easter. I am spending the day with my family. This night we gather in vigil, to commemorate the death and resurrection of Christ, recalling with it, the history of our spiritual path, seeing in it, our own journeys from life to death, and experiencing through it, the initiation from death to life. Incarnate in each one of us, the Sacred Flame is transfixed upon the cross of space and time, May we never fear to descend into our lowest reaches, like the Logos and the harrowing of hell, to reconcile the lower with the higher- that we may rise transformed in this very life, and in the fullness of time ascend into perfect union. My blessings, good wishes and prayers for all the Johannite Parishes, Narthexes, Missions, Oratories and Chapels, our solitary sisters and brothers who keep the flame burning in distant places, and all those who call the Apostolic Johannite Church home, deepening and sharing their journey here. My thanks and gratitude on behalf of the Apostolic Johannite Church to the Johannite Bishops, Priests, Deacons and Seminarians, the Grand Master and Initiates of the Friary, the Prior, Oblates and Knights of the Order of the Temple and Saint John, and the Gnostic Wisdom Network team for all their hard work and dedication- not only to the people we work on behalf of, but also in their own spiritual paths and in their service to each other. Blessings and good wishes also from the Apostolic Johannite Church to the many Churches and communities of good will, especially the Order of Ste. Esclarmonde, the Ecclesia Gnostica Mysteriorum, Ecclesia Gnostica, The Open Rite, Ekklesia Neoplatonismos Theourgia and the Liberal Catholic Union, as well as the many Martinist Orders and Lodges, our Masonic sisters and brothers, and also the many individual friends, family, laity and clergy of good will. May the coming year find your work and paths rich and rewarding with fruitful challenge and blessing, and balanced with rest and reflection. Most of all, may your work be noble, your spirits be humble, and your hearts always full. 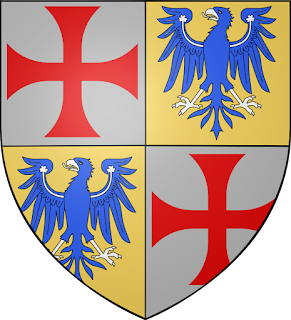 The eleventh Grand Master of the Templars, Robert de Sablé, is one of the most infamous and ruled during the Third Crusade. He was born sometime in 1150 AD in the Anjou region of France to Robert III de Sablé and Hersende d'Anthenaise, a respected military family. His holdings were on land around the River Sarthe valley. He would go onto marry Clemence de Mayenne who gave birth to Marguerite and Philippa. After he joined the Templars, his property passed to his daughter, Marguerite, who was married to William des Roches. During the Revolt of 1173, Robert de Sablé supported Henry the Young King who attempt to depose his father Henry II. Robert would remain in favor though as Richard the Lionheart, Henry's brother, ascended the English throne. Robert de Sablé served as counselor to King Richard I, the Lionheart, of England from 1190 - 1193 and led King Richard's navy into the Mediterranean where he took part in several successive campaigns that recaptures many fortresses and cities along the Levantine Coast that had been lost to the Christians. One of the most notable events was the Battle of Arsuf which occurred on September 7, 1191, and it resulted in a major defeat and retreat of Saladin's forces. After the death of the previous Grand Master, Gérard de Ridefort, at the Siege of Acre in 1189 AD, Robert de Sablé was elected as Grand Master in 1191. At the time of Ridefort's death, Robert de Sablé was not even a member of the Templar order. There was a delay in electing a new Grand Master as the Templar order wanted to avoid losing a Grand Master during battles so they amended the Rule concerning the role of the Grand Master. A year before the elections was held, de Sablé joined the order and King Richard urged the Templars to elect de Sablé. After his election as Grand Master, Robert de Sablé purchased the island of Cyprus from King Richard for 25,000 pieces of silver and served as Lord of Cyprus until 1193 when he sold the island to Guy de Lusignan, the King of Jerusalem; Jerusalem had been captured by the Muslims after the Battle of Hattin. Well, it has been a busy three days; this weekend was the 2019 annual sessions of the Grand York Rite of Idaho in Burley, ID. As usual, Thursday was filled with conferring the chair and honorary degrees: Order of High Priesthood, Order of the Silver Trowel, Knights Preceptor, Order of the Sword of Bunker Hill, Knights of the York Cross of Honor, and Knight Commander of the Temple. I advanced in the appointed line with both Knights Preceptor and Order of the Sword of Bunker Hill. In Idaho Priory of the Knights of the York Cross of Honor, I was elected as Deputy Prior for the ensuing year. I then was one of three candidates that received the Knight Commander of the Temple, the second highest decoration awarded by the Grand Encampment of Knights Templar, USA. Friday morning started with the Public Opening and Joint Session of the Grand York Rite. After that was done, we then re-opened the Idaho Chapter of the Knights Preceptor to confer on 5 candidates who couldn't make it the day before. After lunch, the 116th Annual Conclave of the Grand Commandery of Knights Templar reconvened where I was elected and installed as the Eminent Grand Junior Warden. We held the Divine Services and Holy Land Pilgrimage Dinner at the Burley Masonic Lodge. After dinner, I presided over the annual meeting of Tri-Valley College No.178 of the York Rite Sovereign College of North America. It was a good meeting and I passed the reigns to a very worthy Companion Knight. Saturday brought the 86th Annual Assembly of the Grand Council of Cryptic Masons of Idaho. I was honored to be elected and installed as the Right Illustrious Deputy Grand Master for the ensuing year. After lunch, it was my big moment as I presided over the 111th Annual Convocation of the Grand Chapter of Royal Arch Masons of Idaho. Everything ran smoothly and went off without a hitch. This past year was a very busy one. For work, I traveled roughly 70,000 sky miles and spent over 3-months in a hotel for work. For Freemasonry, I traveled roughly 11,000 miles excluding those Masonic activities that coincided with a work trip. I would like to thank the Companions of the Grand Chapter for electing me to this most honored position and for their support throughout the year. I would like to acknowledge Steven Hall, Most Illustrious Grand Master, and Larry Lathrop, Right Eminent Grand Commander, for their friendship and advice. I wish he were here now, but I remember and thank Most Excellent Companion Ronald G. Berto for appointing me to the Grand Line. I’d like to thank again my Installation Team: Most Excellent Companion Johnny Willis, Most Excellent Companion David Grindle, Most Excellent Companion Jim Herndon, and Most Excellent Companion Joe MacIntyre. I’d like to thank my Grand officers and Committees for putting up with me this year. Lastly, I’d like to acknowledge and thank Companions Jeremy Vaughn and E. Jeffrey Craig for all of their support and constant friendship during this last year. While I will miss serving as Most Excellent Grand High Priest, I am confident in the newly installed Grand High Priest and I look forward to some time off. After a great banquet and fellowship, it is time for bed as there is still a meeting of Intermountain Chapel No.27 of the Commemorative Order of St. Thomas of Acon tomorrow morning before going back home. As I mentioned in A Brief History of Anti-Masonry, "far too many Masons, particularly we American Masons, have forgotten or don't necessarily know about anti-Masonry and the suppression of Masons." Sure we have the occasional vandalism, some conspiracy theorist on a website making absurd claims, and once in a while there is a real threat, but we American Masons have never had to face constant harassment or inquiry in the media or by government officials like the British Masons have; the closest thing we ever faced was a backlash in the 19th century after the Morgan Affair. Back in 2016, Sadiq Khan, the Mayor of London, refused to force officers of the Metropolitan Police Department to declare if they were in the Freemasons or not. In response, anti-Masons were up in arms and a torrent of hatred and fear-mongering spread across the Internet and news media. This article is looking at the contemporary political anti-Masonry that started in the 1990s in England and which still exists today, just from the perspective of an American Mason. Part 1 will cover some of the notable individuals involved with anti-Masonry in England and Part 2 will look at specific events. "When a report on Freemasonry gets ready to air something kind about the fraternity, the Beeb rings up Short for his "on the other hand" take on it, you know, in the interest of "balance." Interestingly, they don't bring in a Holocaust denier when running Auschwitz stories for the sake of balance and compelling reporting." Now, it isn't fair to lay the blame on these authors as they are a symptom of anti-Masonry, not the cause although they helped spread the disease of Masonophobia which isn't just the fear of Freemasonry, but where someone actually acts in a manner that discriminates against masons, in particular at an official level. That being said, with the publication of these books, a new movement of anti-Masonic fervor started and led to members of the British government to propose laws that would require Freemasons in judicial and law enforcement system to declare their membership and be placed on a registry. One of the government officials who led this movement was named Jack Straw who serve as Home Secretary from 1997 to 2001. The Home Secretary is a senior official in the British Cabinet which oversees public services (police, fire, and rescue services), internal affairs, immigration and citizenship, MI5 (Security Service), and prisons and probation (now under the Secretary of Justice). The position of Home Secretary is extremely powerful and in the US that position is split up among several departments. Jack Straw was instrumental in enacting laws and policies that forced cops and members of the judiciary to disclose their Masonic membership. After months of investigation, Jack Straw found zero evidence of any wrongdoing by the fraternity, but still kept this intrusive policy on the books. This continued until 2009 when even Jack Straw admitted the policy was unreasonable to continue, but his decision came a few years after an important judicial case as well as a possible lawsuit from the United Grand Lodge of England. In 2007, the European Court on Human Rights made a judgment on the case "Grande Oriente D`Italia di Palazzo Giustiniani v. Italy (No. 2)." The Court found compulsory registries of Freemasons was a violation of Article 14 and Article 11 of the European Convention on Human Rights as Freemasons were being discriminated against and unjustifiably penalized. Some speculate that Mr. Straw's decision to reverse his archaic policies also had to do with a looming election that would possibly end the Labour Party's term in office. "The review of the policy operating since 1998 has shown no evidence of impropriety or malpractice within the judiciary as a result of a judge being a freemason and in my judgment, therefore, it would be disproportionate to continue the collection or retention of this information." Jack Straw is a well-known face of anti-Masonry in England, but next to him I'd place Chris Mullin, member of the House of Commons and the Home Affairs Committee. In September 1998, Jill Knight wrote an article concerning the investigations ran by the House of Commons Home Affairs Committee on the allegations against Freemasonry. Lady Knight saw the investigations as pointless ("a wild goose chase" she called it) and that Chris Mullin had an unhealthy paranoia against Freemasonry and was convinced, prior to an investigation, that Freemasonry was a sinister organization. Her fears were confirmed by the fact that the committee chose Martin Short as its first witness rather than an unbiased witness. In the total of their investigation, they received 26-memoranda and 153 other documents. The Police Superintendents' Association, the Police Federation, individual Police officers, the Law Society, the Bar Council, the Crown Prosecution Service, the Association of Women Barristers, and even Freemasons testified before this committee. Most of whom provided no evidence that Freemasonry was maliciously influencing the justice system in England. She concluded that the anti-Masonic testimony was based on perception, not fact. One such example came from ten Police officers claimed undue Masonic influence such suppression of serious criminal and disciplinary matters, promotion preferment, cheating in promotion examinations and the falsifying of blood test results of Freemasons charged with drunk driving offenses. However, with all of these allegations, none of them provided any evidence. During my second deployment to Iraq, I faced a similar situation. I was asked by Battalion Sergeant Major about Freemasonry. After my comments, he told me that soldiers have accused a Company Commander of giving preferential treatment to Freemasons. I responded by pointing out that nepotism is not a principle held by Freemasonry. Sometime later I found out that the soldiers making the accusation were simply trying to supplant their Company Commander and his authority by making allegations of Masonic impropriety. While the investigation provided no evidence to warrant a compulsory registry, a majority of the committee members decided to recommend that members of law enforcement and the judicial system should be required to declare their membership in Freemasonry. So here we have an official investigation finding no wrongdoing on the part of the fraternity, but still being penalized due to nothing more than rumors and nebulous allegations; all of this would be turned into fuel for more allegations. Chris Mullin went on to make, what seems to be a political faux pas, by disclosing the names of Freemasons in the West Midlands Police Force. Lady Knight notes that this police force was instrumental in investigating the Birmingham pub bombings of 1974 which left 22 people killed and around 70 injured. The bombings were still remembered in 1998. Chris Mullin was also the one who campaigned for the release of the convicted bombers stating that he knew the identity of the real bomber, but would not divulge the name. It is ironic that Mr. Mullin wouldn't disclose the name of a criminal, but enforced a policy that required innocent men to disclose their names for the crime of being a Mason. Having covered some of the more infamous anti-Masons, Part 2 will cover anti-Masonic events such as the Church of England's stance on Freemasonry, further harassment of Masons in the British Police, and the British media constant assault on the fraternity.